Vehicle rollover collisions are not as common as other types of accidents, but when they do occur, they can result in severe consequences for those involved. It is common for drivers and passengers to be injured when the roof caves in. This is referred to as “roof crush,” and it can cause severe head, neck, and spinal cord injuries. If safety features fail, such as door latches, seat backs, and seat belts, occupants can be thrown from the vehicle. When this happens, the individual runs the risk of being crushed by the vehicle itself, or hit by other cars on the road. If you or a loved one was injured or killed in a vehicle rollover accident, you may have a right to compensation. Certain types of vehicles are more prone to rolling over, particularly those with a high center of gravity. For example, SUVs and pickup trucks are more likely to roll than cars with a lower center of gravity (such as sedans). Rollover crashes can be caused by collisions with other vehicles, collision avoidance maneuvers, poorly designed roadway, excessive speed, tire blowout, or vehicle design defect, among other causes. Since there are a wide variety of potential causes of rollover crashes, it is important to investigate carefully to be sure that all responsible parties are identified. 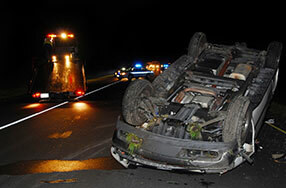 Where there are multiple causes of a rollover crash, there may be claims against multiple at-fault parties. If a rollover accident is caused by a collision with another vehicle, or maneuvers to avoid crashing into another vehicle, those injured generally have claims against the driver (i.e. insurance company) of the vehicle that caused the crash. In these cases it is often apparent who caused the crash, but in the “phantom vehicle” context, it may be difficult to identify the other car involved. In legal cases, a “phantom vehicle” is a vehicle that causes injury, death, or damage without making physical contact. For example, a vehicle that veers into your lane and forces you off the road without actually hitting your car would be considered a “phantom vehicle.” A proper investigation into at-fault drivers could include review of traffic cam footage, business security camera footage, and interviewing witnesses to the incident. If the “phantom vehicle” remains unknown, you will likely have a claim under your own under-insured motorist (UIM) coverage. You can learn more about phantom vehicle crashes on our hit-and-run collisions page. Rollover collisions resulting from other types of causes than collisions with other vehicles often involve highly technical analysis to identify the responsible parties. If a vehicle rolls due to unsafe road design, there may be claims against the entity that owns the road, such as city or state government. However, to determine if a claim exists, it will be necessary to consult with engineers and/or highway design experts to determine if the road design is unreasonably dangerous. Such experts will be able to assess issues like whether lanes were too narrow, whether the posted speed limit is appropriate for the location, whether there are unsafe depressions allowing water/ice to collect, whether the cross-slope (pitch from centerline to edge of road) is appropriately angled, and other factors. For more information, see our page on highway design defects. Finally, there may be claims against the auto manufacturer, tire manufacturer, or part manufacturer arising from rollover accidents caused by design or manufacturing defects. Similar to highway design defect cases, the investigation into vehicle design or manufacturing defects is highly technical and usually requires consultation with industry experts. For example, if a tire blowout causes a vehicle to lose stability and roll over, generally an expert in tire manufacturing and design must be consulted to determine whether the tire at issue was defective. If so, the tire manufacturer may be held responsible for any injuries and damages resulting from the crash. Similarly, if vehicle occupant is ejected during a rollover due to a faulty door latch, there would likely be a claim against the vehicle manufacturer and latch manufacturer. Even if you caused the initial rollover incident, you may be entitled to compensation to the extent your injuries were made worse due to the failure of a vehicle safety device. For more information, see our page on product liability claims.